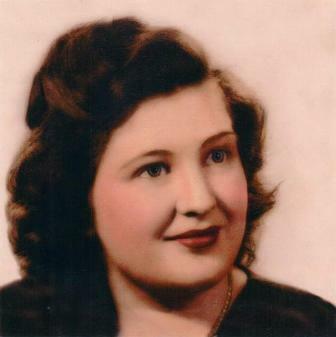 Mrs. Mary Ellen Milanowski, age 92, of Salamanca, New York died Thursday, May 21, 2015 at the Absolut of Salamanca, New York. Born March 10, 1923 in Buffalo, NY, she was the daughter of the late Thomas and Mary Durkin Needham. She was married in the former Holy Cross Church on May 31, 1947 to Mr. Walter Milanowski Sr., who predeceased her on November 10, 1993. She had been employed at Bell Aircraft in Buffalo, NY, the former Weston’s Bakery, the former Fancher Furniture Company, and the former Sheble & Wood Woolen Mill, all in Salamanca, NY. She was a member of Our Lady of Peace Parish, a life member of the Ladies’ Auxiliary of the Veterans of Foreign Wars John F. Ahrens Post #5296, a past 6th District President, where she was President of the Year, achieved #1 in memberships, was the Cattaraugus/Allegany County Council President, County President of the Year, and runner-up for County President of the Year. She was also a member of the Ladies’ Auxiliary of the American Legion Hughes-Skiba Post #535, the Holy Cross Athletic Club, and the former Women of the Moose Club Chapter 96. She was Chairman of the American Cancer Society for over 20 years. She was an avid Bingo player, a fan of the Triple Crown Series horse races, and was a member of many bowling leagues. Surviving are: 2 sons, Thomas (Sue Moore) Milanowski, Salamanca, NY, Stanley (Darlene) Milanowski, Salamanca, NY; 4 daughters, Kathleen Hyson, Salamanca, NY, Elizabeth (Barry) Yuhas, Salamanca, NY, Ellen (Dana) Story, Great Valley, NY, Susan (William) LaBuhn, Salamanca, NY; 13 grandchildren, James (Lindsay) Milanowski, Peachtree City, GA, Stephen Hyson, Matthew (Jackie Forand) Hyson, both of Colebrook, NH, Joseph Story, Olean, NY, Scott (Amanda) Story, Salamanca, NY, Michael (Melissa Harrington) Milanowski, Salamanca, NY, Christie (Jeff) Pond, John Milanowski, Megan Pedacchio, all of Salamanca, NY, Christian (Courtney) Milanowski, HI, Ryan (Nandini) LaBuhn, Rochester, NY, Tony (Laura) Hodara, Kill Buck, NY, TJ Milanowski, Salamanca, NY; 16 great-grandchildren, Sienna Milanowski and Jake Milanowski, both of Peachtree City, GA, Ashley Story, Salamanca, NY, Logan Lewis, Randolph, NY, Bryant Johnson, Brandon Milanowski, Haley Pond, Jarrett Pond, all of Salamanca, NY, Maya LaBuhn, Sam LaBuhn, both of Rochester, NY, Grace Hodara, Sophie Hodara, Kill Buck, NY, Dimitrious Taylor, Nikalos Story, Jacob Wyatt, Carter Milanowski, Salamanca, NY; two sisters, Carolyn Gendrue, Harbor City, CA, Bonnie Gendrue, Salamanca, NY; several nieces and nephews; two special friends, Helene Wrona, Salamanca, NY and Noreen Holleran, Lackawanna, NY. She was predeceased by a son, Walter “Wally” Milanowski Jr.; three granddaughters, Sonja Hodara, Michelle Hodara, Anne Marie Milanowski; a sister, Margaret Needham; two brothers, Patrick Gendrue and Fred Gendrue. Friends may call at the O’Rourke & O’Rourke Inc. Funeral Home, 25 River Street, Salamanca, New York on Sunday from 2 – 4 and 7 – 9 p.m.
A Mass of Christian Burial will be held on Monday, May 25, 2015 at 11 a.m. in Our Lady of Peace Parish with Rev. Patrick Melfi, pastor, as celebrant. In lieu of flowers, the family suggests memorials to the American Cancer Society, 101 John J. Audubon Parkway Amherst, New York 14228-1198, and The Cattaraugus/Allegany County Homeless Veterans Association.